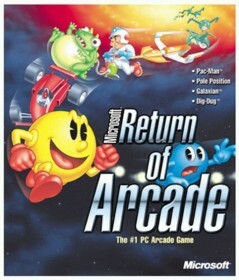 Microsoft Return of Arcade is a PC game in the Other genre. The game was published by Microsoft and developed by Microsoft Game Studios. The game has an ESRB Rating of E (Everyone 6+) and was released on 1993-01-01. The game's official site can be found at www.microsoft.com/games/arcade2/home.aspx. Nice old school arcade bundle by Microsoft. This arcade compilation set definitely brought back some fond memories of my arcade days. The set by Microsoft features four arcade titles for your gaming pleasure. The four games featured are Dig Dug (that great dig and blow up game), Pole Position (amazing fun arcade f1 racer), Pac Man (the fun gobble and chomping ghost game starring “puck man”) and Galaxian (a nice top down space alien shooter). These four games are very fun although I wish more games were included as the fun will end quite quickly if you only like one or two of the games included in this retro package. The graphics, soundtracks, and sound effects as well as gameplay are all retained in their classic glory. The one added feature of porting them to windows is that you can now customize your controls (keyboard button layout and joystick support) as well as the number of lives which is also a welcome feature. Overall this is a very nice compilation but I really feel that at least 6-10 more games should have been included with the game and maybe some type of graphical/sound enhancement.